If the sight of Andy Murray climbing the Wimbledon stairs and into the arms of his Mum during a momentous Grand Slam win got you in the mood for getting on the whites and heading out to the courts yourself, great. 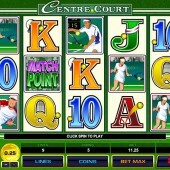 If, like the rest of us however, you merely gave a little fist-pump and got back to slouching in front of the computer for another slots session, you'll probably settle for slot developer Microgaming's competent tennis-related slot, Centre Court. This is not only a slot game for tennis fans so do not dismiss it straight off the racquet if you find watching a ball hit back and forth over a net slightly tedious. There is more to this game than meets the eye and it is worth having a look further down this page to see what it fully offers. Taking its cue from England's premier tennis tournament (minus the rain breaks and strawberries) Centre Court is a 5-reel, 9-payline game with some friendly betting ranges for smaller wallets, and plenty of tennis-related imagery. In fact, the green and gold of Wimbledon are the colour themes here, with the game screen even surrounded by white chalk marks. There are four tennis players among the reels' icons - although sadly, no real-life ones - plus the regular 10-through-Ace card symbols, a 'Match Point' logo and trophies. There's even a nice tennis ball noise as the reels come to a stop after each spin. The gold cup icon acts as the game's Wild, and it substitutes for all regular symbols other than the Scatters. Look for the tennis ball Scatter, as three or more of those across the reels triggers a bonus round with a mammoth 18 free spins that carry a multiplier of 2 to 5x. Not only that, but the gold trophy Wild will become Stacked if it appears during the bonus round, and is capable of filling an entire reel. OpenBet's star-studded Top Trumps Tennis Stars slot has been here before, of course, and followed in the footsteps of the excellent football-themed slot, Top Trumps: World Football Stars from Playtech, with its photo-realistic images of tennis stars past and present. Not only did you get plenty of real-life pics of McEnroe, Borg et al, but the bonuses were pretty healthy, too: a $500,000 jackpot is up for grabs in that game. 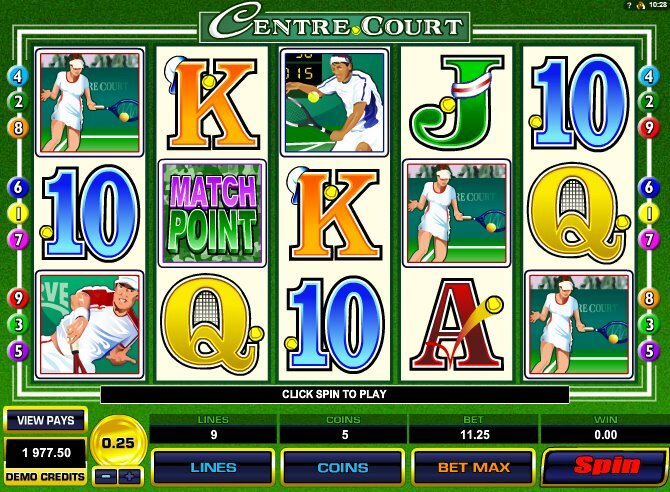 As far as sports-themed slots go, Centre Court certainly dishes up a volley of atmosphere from the classic tennis tourney, but if you like your video slots serving up a few more aces, stick with OpenBet's sports-themed games. Perhaps it's Game and Set to Microgaming if not Game, Set and Match.